Lightly mix together the cottage cheese and sun-dried tomato pesto. Core the tomato and slice vertically into six partial wedges, cutting carefully so the tomato stays together at the bottom. Place the tomato on a plate or in a shallow bowl, opening the wedges slightly. 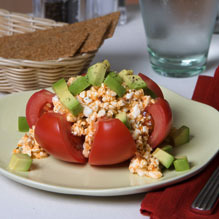 Spoon cottage cheese mixture into the center of the tomato. Garnish with avocado pieces. Season to taste with salt and pepper.